Just because the onslaught of pre- Thanksgiving pumpkin recipes has wound down doesn't mean we've stopped cooking with it. Far from it, in fact. Pumpkin puree (yes, even the canned) is a terrific source of nutrition and it adds a delicate taste and moistness to lots of recipes. Cornbread, in particular, can get dry and so I've had my eye on a pumpkin cornbread recipe for quite some time. Since I'm still getting over my Thanksgiving head cold of doom, I wanted something comforting. And quite frankly, I've already eaten my weight in soup for the past 4 days. Add to that the fact that it's raining, snowing and freezing in New York today and I didn't really feel like taking my sick self out shopping. I realized that I have all the ingredients in the house to make the pumpkin cornbread and so now seemed like the perfect time. It baked perfectly - moist, not overly sweet and with a mild pumpkin flavor. It was great with butter, honey or maple syrup. Since I was tired of soup and still too weak to whip together a chili, I chose to eat breakfast for dinner and have it with bacon and fried eggs. What a great combination with the pumpkin cornbread! Enjoy! In a bowl, whisk together the flour, cornmeal, sugar, baking powder, salt and cinnamon. In a separate bowl, whisk together the eggs, pumpkin puree and oil. Add the wet mixture to the dry mixture and stir until combined. Pour into a greased baking dish (about 8" square) and bake in a pre-heated 400 degree oven for 25 - 30 minutes, or until a toothpick inserted in the center, comes out clean. Makes approximately 9 servings. Oooh I love that the pumpkin helps keep the cornbread from being dry!! So great! Looks amazing Anita! I hope you start to feel better soon. YUM! and moist cornbread without cheese in it for a change - great! Looks so fluffy and moist!!! I love this combo! Mmmmmmmmmm, girl, please send me some when you're well. I'll send you, I don't know...tissues. feel better soon!! this bread looks so moist and fluffy, such a great idea to add pumpkin to it! This is a great, great idea for moistening up cornbread, which can all too often be on the dry side. Plus the pumpkin is a perfect flavor to complement the cornbread's, well, corniness. Definitely one to make soon. Hope you're feeling better! Oh wow! 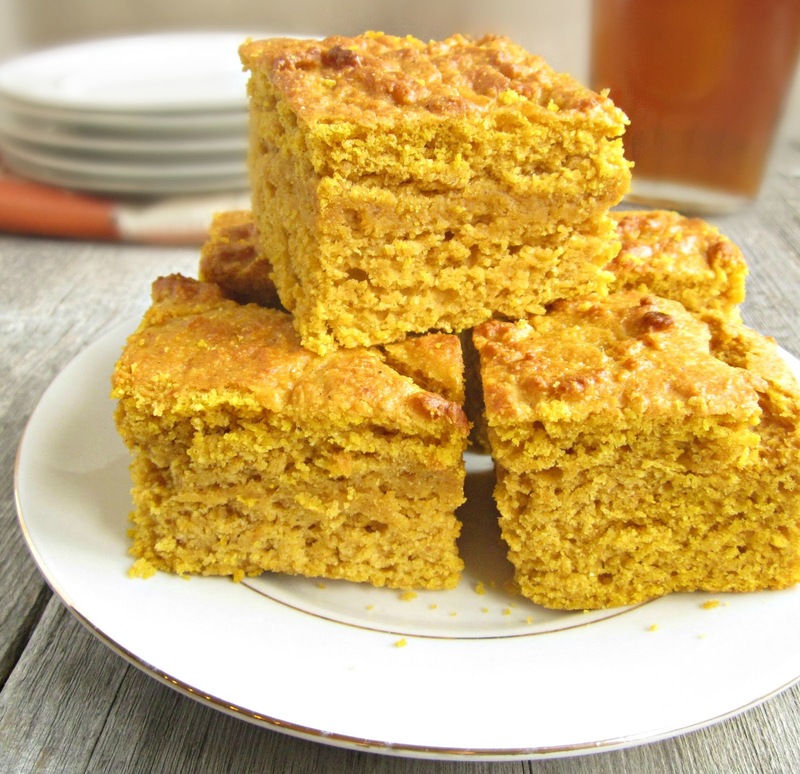 I really love the idea of adding pumpkin to cornbread. So perfect for the fall/winter and I bet it does add so much great moistness. Thanks for the wonderful idea! OH MY GOSH Anita! I've never even heard of pumpkin cornbread, and I absolutely love cornbread. This will definitely be a must try! Glad to hear you are feeling better and stay warm. I can't imagine snow right now! It's in the 60s here during the day and in the mid to low 30s at night. Sending some warm air your way! This over the top cornbread had to make you fee better! I would never have thought of this combo, it sounds and look amazing. Try mashed sweetpotatoes also. Very very good too! I've got it in the oven. Thanks! I hope you don't mind that I used one of your pictures as the inspiration for my pumpkin cornbread recipe that was an adaption of your recipe. I linked back to you twice and gave you credit. Thanks for giving me a great recipe that I could easily tweak!